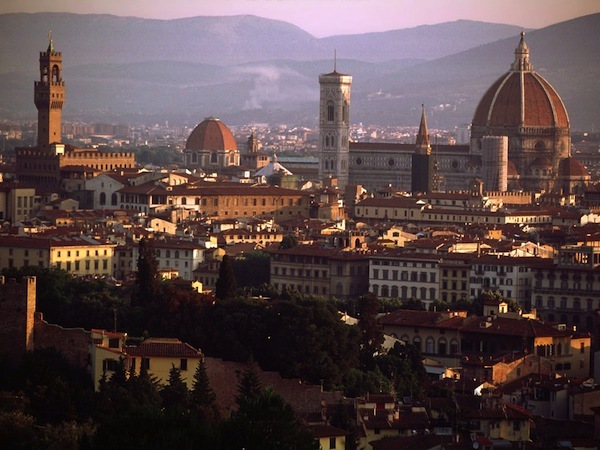 Florence, the cradle of the Renaissance period, where you breathe art in its Medieval streets, the craftsmen's’ workshops and the Renaissance Palaces. Here, the memories of the Medici family are linked with the splendour of the works of the renowned artists like Michelangelo, Leonardo da vinci, Botticelli. Leaving Rome in a northerly direction and crossing the green valley of the Tiber, you pass the slopes of the Apennines covered with olive groves and vineyards to reach the famous valley of Chianti, before finally arriving in Florence built on the banks of the river Arno. The city tour will start with a visit to the Academy Museum where you will see the magnificent David by Michelangelo before continuing on foot with your local guide to see the Cathedral of Santa Maria del Fiore with its beautiful dome by Brunelleschi. Other treasures, the Baptistry and Giotto’s Bell Tower can also be admired before reaching Piazza della Signora, the ‘heart’ of Florence. Your included lunch will be served in a typical Florentine restaurant before resuming your walk in the afternoon and making you way to Piazza Santa Croce where the church of the same name is situated and where great artists like Michelangelo are buried. You will have the opportunity to visit the leather shop in order to admire one of the typical crafts of the city, and here you will also have some free time to see the work of local goldsmiths and other traditional craftsmen. Departure from Florence at approximately 5.00 pm for the return journey to Rome. return to the vicinity of your hotel.